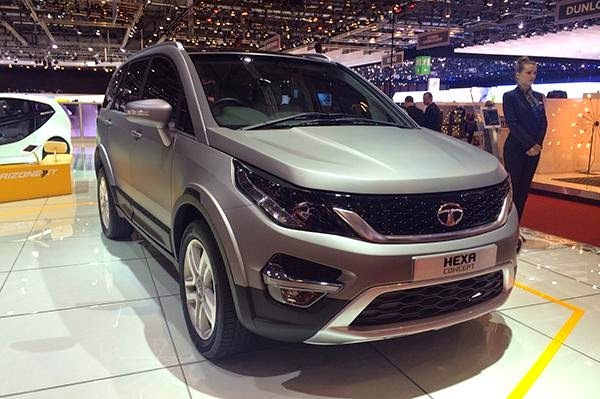 Tata Motors has unveiled the new Hexa crossover concept at the ongoing Geneva motor show 2015. The carmaker says this concept “unveils a new design language for Tata SUVs”. Internally known as the “Eagle”, the Hexa concept is based on the Tata Aria, but now gets a completely new identity in the form of its revamped styling. Up front, the all-new bonnet is now flatter and features a clamshell design. 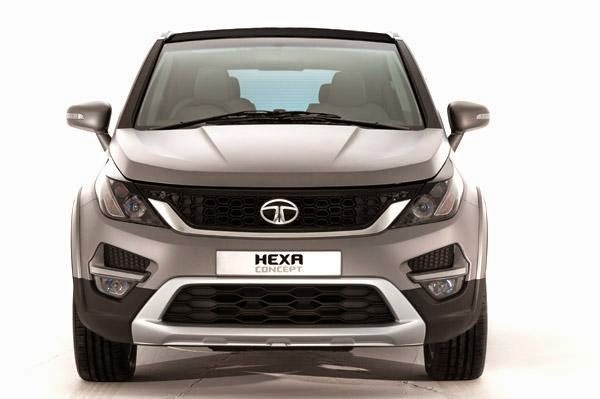 The new-look Tata grille is wide brushed aluminium strips curling upwards like a smile. The projector headlights merge neatly in the wide grille. The front bumper features a wide air dam framed by a prominent brushed-aluminium border. The fog lamp inserts are huge and give the bumper a muscular stance. Moving on to the sides, the Hexa concept does resemble the Aria a bit, and hasn't managed to completely shrug off the MPV look. Notable design tweaks include prominent wheel arches, and a thick body cladding running along the sides, which give it the look of a crossover. 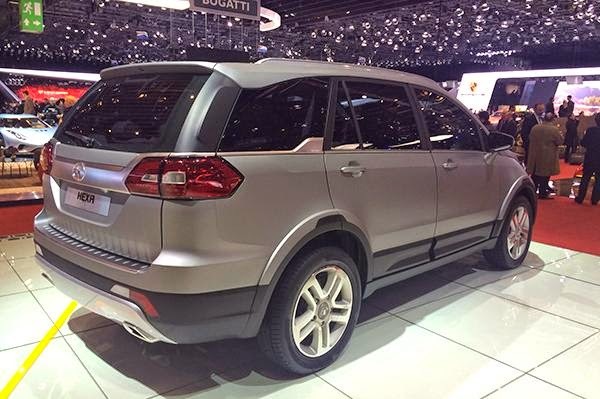 While the Hexa concept’s glasshouse is also carried over from the Aria. But Tata has made major changes at the back like the floating roof which gives it a different look. The Hexa concept gets 19-inch alloy wheels that go well with its cross-over feel. 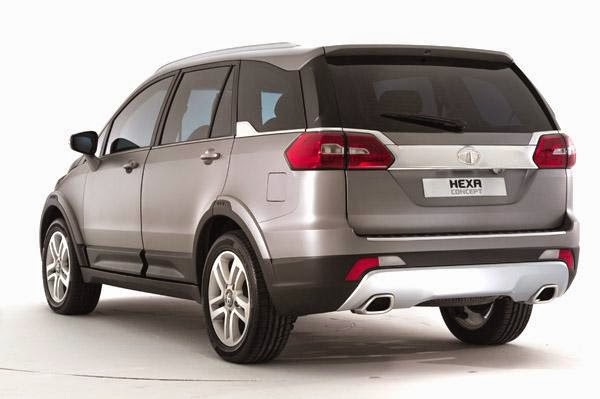 The Hexa’s rear styling is a complete departure from the Aria’s minimalistic look. Neat horizontal tail lamps are placed just below the rear glass and extend onto the hatch. A wide band of chrome strip runs across and connects the tail-lamps and even runs to the sides. The rear bumper is divided into three layers – the top-most, painted in body colour, has prominent embossed lines on the loading lip, while the lower half gets cladding and a brushed aluminium faux skid plate. 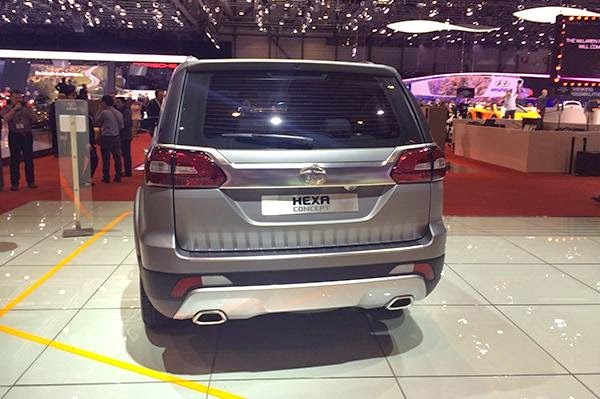 Like the Aria, the Hexa also comes with dual exhausts. The interiors of the Hexa concept are dual tone and feature a prominent touchscreen interface, climate control and dedicated buttons for 4WD. The instrument cluster has two rings with chrome borders. 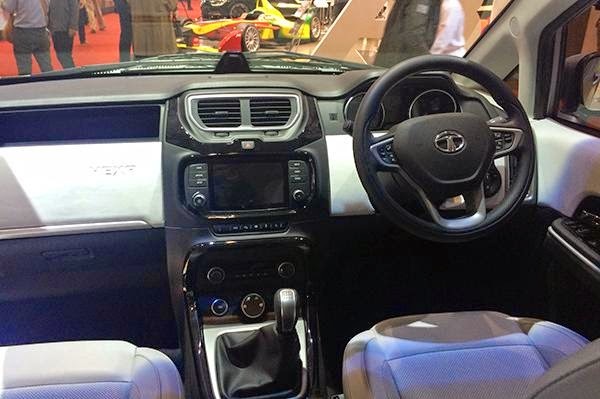 The steering wheel is shared with the Zest and gets controls for audio and Bluetooth. The Hexa also features the familiar Harman infotainment system that does duty on the Bolt and the Zest. The Hexa concept comes with a six-seat configuration, with two individual captain chairs for the first two rows and a split-folding bench seat for the third row. It also sports a 12V power socket and AC vents for the second- and third-row passengers. 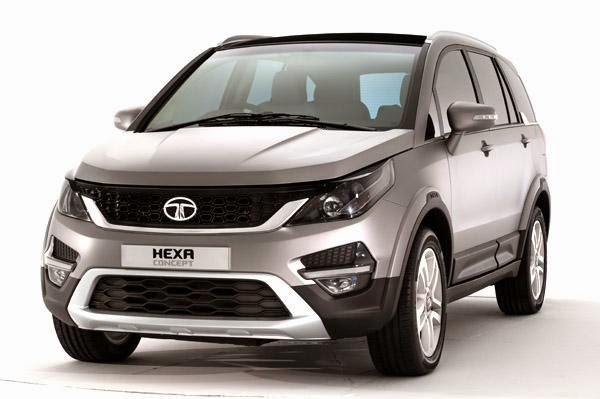 The close-to-production Tata Hexa is powered by a 2.2-litre Varicor motor, recently seen on the updated Aria. A torque-on-demand 4WD will be offered as an option. Additional features include ESP, LED tail lamps, LED mood-lighting interior lamps, six airbags including side and curtain units, and automatic headlamps along with rain-sensing wipers. The Tata Hexa concept is 4764mm long, 1895mm wide and 1780mm high and comes with a 2850mm long wheelbase. 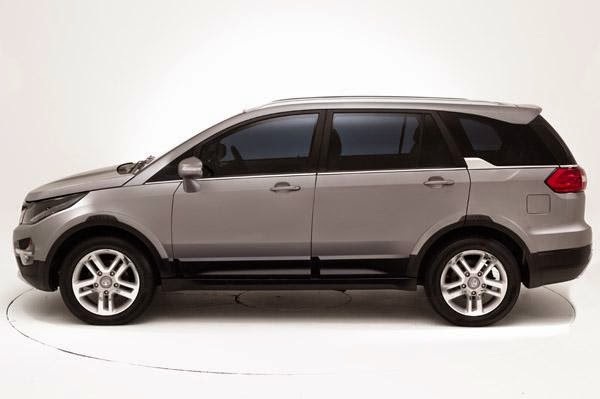 By the looks of it, now more rugged and up-to-date looking Hexa looks like it will command a lot of respect on our roads.